Community owned power is key! Over the last few months my blog has examined the problems of climate change. We have read about the plans our government has to continue the disastrous march towards the brink of climate melt down. I have posted many articles about the renewable energy sources available today. Democracy of power; Break fossil fuel monopoly. Only by taking back ownership of the means of energy production will the people regain control of our environmental destiny. Below is an article about a courageous town that has stopped fracking in its tracks and created a renewable energy program to take their town off the grid. 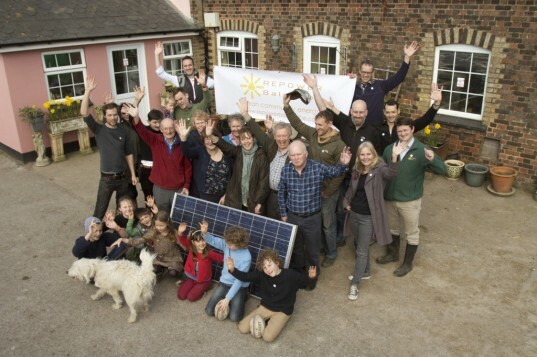 Tiny English Village Blocks Giant Fracking Operation, Announces Plans to Build Community-Owned Solar Power Plants. No Fracking AND we will produce our own energy! Normally, the village of Balcombe, West Sussex is just another picturesque spot in a valley where nothing really happens. But when Cuadrilla Resources–the UK’s fracking pioneer–announced plans to do some exploratory drilling just five miles from the town, the citizens sprang into action. For two months they protested in an anti-fracking camp set up on the outskirts of town. Finally, the company announced it was abandoning the drill site. Not because of the protests, of course, but because rocks at the site already contain natural fractures, making it unsuitable for profitable extraction. But the activism of this tiny down didn’t disappear with the drilling rigs. Now the citizens have formed REPOWERBalcombe, a community coalition that seeks to finance and build community-owned solar power plants, and someday, take Balcombe off the grid entirely. 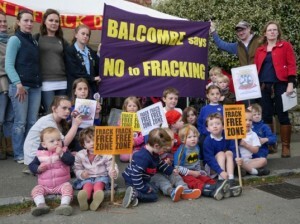 Balcombe taking ownership of their energy! Related: German Village Produces 321% More Energy Than It Needs! “Our goal is to set up a program of renewable energy solutions based in and around the community. The aim is to generate the equivalent of 10% of Balcombe’s electricity usage through rooftop solar panels within the next 6 months, and eventually to generate the equivalent of 100% of the village’s electricity usage from clean, renewable energy sources,” explains the cooperative. To do that, they’ll need to raise £300,000 (approximately $500,000). That’s a lot of money, so REPOWERBalcombe plans to offer shares to the community. They expect that residents who invest in the program will enjoy at least a 5% return during the 20-year lifetime of the scheme. Not to mention the knowledge that they helped finance a project that could make their community completely self-sufficient when it comes to energy. In late March 2014, the group “announced it has signed a lease to host the first 19kw array on the roof of a cow shed, at a local family-owned farm. Talks are under way about a further five sites, which could be fitted with solar this spring,” reports The Guardian. “We all need energy, but buying dirty fossil power from giant utilities is no longer the only option,” REPOWER Balcombe spokesman Joe Nixon told the paper. This Blogger thanks the above for their work. Keep the faith and carry on!